The University of St. Augustine for Health Sciences offers a flexible way to obtain your Master of Occupational Therapy (MOT) degree Online through our Flex distance education program. The Flex program combines online learning with face-to-face hands-on instruction during a few weekends per month at the campus you select during the application process. Learn online at your own pace, when and where you want to, then meet your fellow students on campus during weekends to experience USAHS’s clinical education from faculty that pioneered distance learning in the OT field. On-campus lab sessions are held during weekends so your time required on campus is minimized. Two fieldwork experiences during the second half of the program deliver critical hands-on experience and patient management skills. These internships are 12 weeks long and require the student’s full-time participation. The Flex MOT program offers students the opportunity to tap into USAHS’s extensive, global network of MOT alumni and practitioners. Start at the time of year that best suits your schedule. Our St. Augustine campus offers start dates in January and September. Our Austin and Miami campuses offer start dates in May and September. 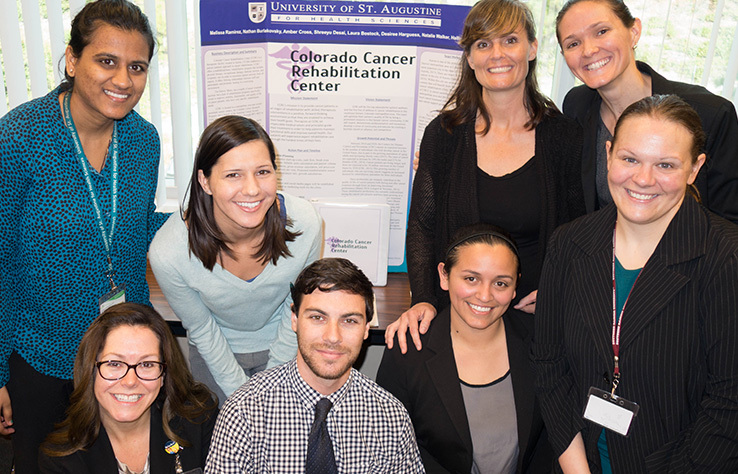 The mission of the MOT program at the University of St. Augustine for Health Sciences is to graduate a diverse population of practitioners who have the skills necessary to analyze human occupation and to implement science-driven and evidence-based interventions that promote quality of life for the clients whom they serve. Graduates will contribute to their profession and to a global society through their competence, ethical standards, and professionalism. The Flex MOT program is a combination of distance learning – more than 50% of the coursework is delivered online – and on-campus laboratory classes. Don’t worry if you’ve not taken an online class before. USAHS has an excellent online orientation (i.e. Student Readiness Orientation or “SRO”) program to help you learn how to navigate the course software and prepare you for being an online student. Each course also contains a help section and tech support is readily available to all students. In courses with a lab component, students meet on campus for up to 16 hours of laboratory classes per weekend between seven and eight weekends in a 15-week trimester. The lab sessions focus on hands-on learning which is vital to occupational therapy education, as well as oral presentations, lab practical testing, social activities, and some proctored written examinations. For more information on our Flex MOT program, please contact us today to connect with an enrollment advisor, register for an upcoming MOT/OTD information session (virtual) or register for a campus tour at the Miami, St. Augustine or Austin, TX campus. Exhibit the skills of a professional occupational therapist through a commitment to lifelong learning. Practice clinical reasoning skills based on foundational knowledge and professional skills in order to provide optimal interventions for client problems in varied settings. Ensure optimal and culturally competent verbal and written communication of occupational therapy services. Use effective leadership skills to advance the role of occupational therapy. Evaluate evidence-based information by accessing resources and interpreting information for competent interventions.